The Mexican culture holds the most influence in the city, especially in the east side. And at casual Xoia Vietnamese Eats, located along Sunset Boulevard in Echo Park, it’s no different. However, this restaurant, the brainchild of Thien Ho and husband Jose Sarinana, is invariably very much Vietnamese, using traditional ingredients like lemongrass and banana blossom as well as serving familiar dishes such as banh mi, which comes with a side of shrimp chips, pho, green papaya salad and Mi Quang. Crowd pleasers include the Lemongrass Beef Banh Mi and Pho Tai. It’s Xoia’s Vietnamese-Mexican mashup dishes that we’re most drawn to, though: the Chicken Curry Tostadas served with the house cream sauce; the Crispy Pork tacos; and the House Fries, lightly seasoned with Vietnamese flavors and served in heaps with your choice of dipping sauce (try the curry or garlic mayo). Pair those with Hue beer or a Belgian at two in the morning on a Saturday, and you’re good to go. While Thai and Vietnamese cuisines have already set permanent roots in the American food culture, their Southeast Asian neighbor has yet to make its mark, which is unfortunate as Filipino cuisine, with its rich meat and veggie stews, tasty soups and influences from China and Spain, is just as good. Only a handful of major cities have their crop of Filipino restaurants, and Los Angeles is one of them. Sampling Filipino fares while in the city, therefore, is a must. Head out to Glendale for Max’s Restaurant, whose centerpiece—crispy fried chicken served with banana ketchup—has been praised by Jonathan Gold himself. The chicken is indeed a must-try, but other dishes here have to be sampled as well. Try the delicious Lechon Kawali (deep-fried pork belly) or the Crispy Pata (deep-fried pork hock), the hearty Kare Kare (peanut-based beef stew), the ever-popular Lumpiang Shanghai (egg rolls), the comforting Pork Sinigang (a tamarind-based soup) and the Fried Bangus (milkfish). For dessert, the Halo-Halo, a medley of fruit preserves, beans, purple yam, flan, ice cream and shaved ice, is essential. While LA’s Chinatown is littered with terrific Chinese restaurants, you don’t necessarily go there for amazing dim sum. Lunasia, one of the city’s best dim sum spots, for example, is in both Pasadena—not too far from its historic Old Town—and Alhambra along Main Street, the original location. 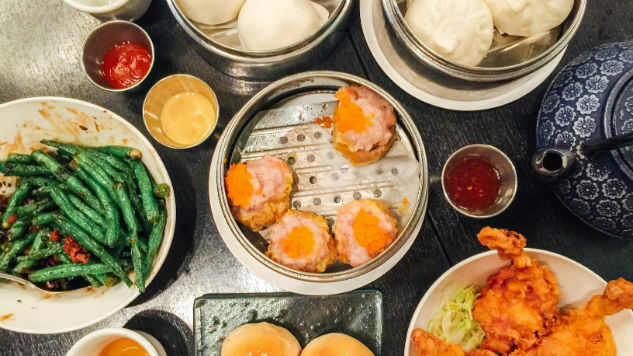 Don’t expect any rolling dim sum carts here, or sticky tables and grumpy servers that unceremoniously dump your orders on the table for that matter. Lunasia boasts a more upscale and friendlier atmosphere, but don’t think that ruins the authenticity of the experience or the food. Steaming baskets filled with delicious bite-size goodness are served fresh from the kitchen, which might mean you have to wait a little before digging in. And there are more than enough options on offer so you’ll always be in danger of ordering too many, if there’s such a thing. Start with the Pork Dumplings; the massive Pork and Shrimp Siu Mai; Fried Chicken Drumettes; and the highly addictive, ground pork sprinkled Pan Fried String Beans. Los Angeles has its fair share of Mediterranean restaurants, from fast casual franchise Zankou Chicken to the more local, mom-and-pop joints. It’s Spitz’s Turkish touch and Döner Kebab—made famous in Germany, Austria and Belgium—that give this restaurant an edge. With four locations around the city, including Los Feliz and Eagle Rock, Spitz’s Mediterranean street food and terrific craft beer selection make it very popular among locals. At their Eagle Rock location, their filling fares that come in generous helpings are enjoyed in the open-air string light adorned dining area. Start with a hearty plate of Street Cart Fries or the Döner Basket, and follow up with their Street Cart Döner, their most popular wrap. Beef and Lamb Doquitos are also on offer and just as delicious. If you’re looking for a lighter dish, try the Döner Salad flourished with lavash chips and crispy garbanzo beans. Sweet potato fries and fried pita strips with hummus are also on hand if you’re looking for light bites with your beer. Miami and New York may have the largest Cuban-American populations in the country but LA has also been home to many with Cuban ancestry since the 1960s. In fact, Echo Park was known as Little Havana back in the day. It comes as no surprise, therefore, that the city boasts a number of restaurants that serve authentic, down-home Cuban food. Among them is low-key La Caridad Restaurant, arguably one of the east side’s best Cuban spots. Famous for its Cuban sandwich, voted one of the best sandwiches in LA by Eater, La Caridad is incidentally located in Echo Park, right on Sunset Boulevard not far from Xoia. Rabo Encendido (oxtail stew) is a huge hit, as are Carne con Papas and the Chicken Fricase, which has been described by some as the best thing on earth. Best of all, they cater so you can indulge in and serve these amazing dishes at parties, and the staff is wonderful. It’s hard not to get sidetracked by LA’s assortment of touristy food go-tos. After all, there are umpteen In-N-Out Burgers, lining up at Pink’s seems like a fun Hollywood experience, and the lure of fried chicken and waffles at Roscoe’s may be a tad hard to resist. But one simply has to dig just a little deeper to see that there’s more to Los Angeles’ food scene, so much more. And it’s one that mirrors the city’s ragbag of cultures and eclectic taste. We’ve already given you some of LA’s best east side joints to score some ethnic eats. Here are five more—from Southeast Asian to Cuban—to add to your list.